THE PARADIGM SHIFT | Watchman - Declare What You See! As noted previously in this series of articles, understanding the role of the Egyptian Sun-god Re, also spelled Ra, is critical to understanding how the Luciferian/Illuminati “Plan of the Ages” has been designed to play out in the rise of Antichrist and the New World Order under Lucifer. Taken from Wikipedia, the following offering describes Re. You may notice from the description of Heliopolis, that it was the capital of the 13th Lower Egyptian nome, and 13 is the number associated with rebellion and witchcraft. It has been shown in this series of articles why I believe that the 13th World Leader will be the Lucifer in the flesh – Antichrist! 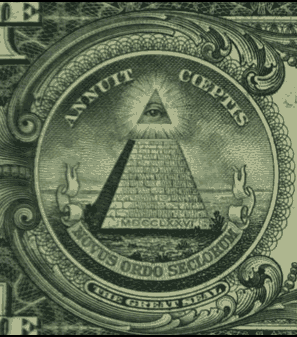 Like Ancient Egypt, America has been divided into “city states” or “divisions” which have gone through a “unification process” (United States) just as in Ancient Egypt. America is the physical country of Last-Day Babylon of Scripture, whereas, the city that rides the Beast (World System) is clearly New York City. Scripture is clear that the “woman” who rides the Beast is that “great city”. The Ancient Babylonian Mystery Religions were carried to Egypt and the rest of the world over time, and today the effect of this “Mystery Religion'” can be seen world-wide as well as in America. Many of America’s cities and monuments are named after the cities of ancient Egypt, or portray the actual artifacts or replicas of Ancient Egypt. Memphis, Tennessee is but one example, and in Memphis a Pyramid stands on the banks of the Mississippi River just as in Ancient Egypt where Memphis stood on the west bank of the Nile River south of Cairo. Of course, the most notable of all Ancient Egyptian “reproductions” is what most people know as the Washington Monument – the Obelisk to the Sun-god Osiris/Nimrod/Baal/. The fact that this obelisk still represents the exact same thing in our day as it did in Ancient Egypt is amazing in and of itself, but it also is a “time-piece” in Satan’s plan to place Lucifer on the throne! The Son Of Osiris/Nimrod/Baal is destined to “come forth” as the re-incarnation of Osiris/Nimrod/Baal in the form of Horus/Adonis/Lucifer/Antichrist! 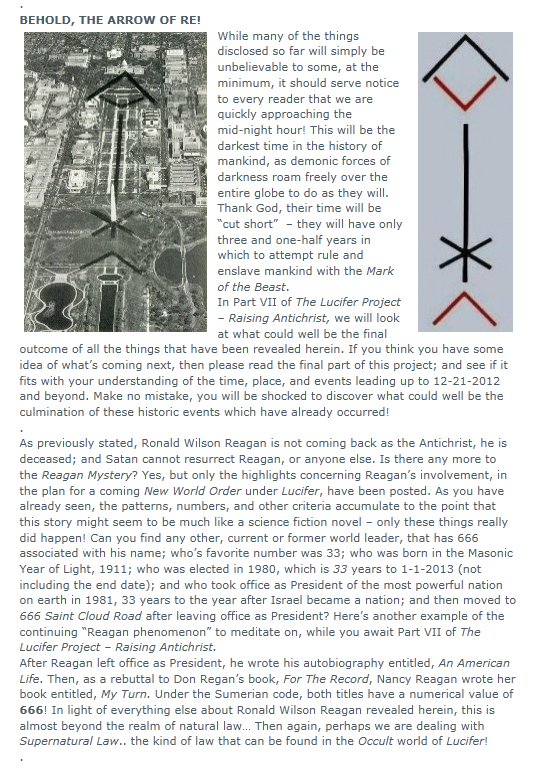 Here’s a section of what was posted in, The Lucifer Project – Raising Antichrist Part VI, in regard to the “Arrow of RE”. The “Arrow of Re” served as a “resurrection ritual” in Ancient Egypt that represented the Sun-god Osiris being resurrected in the form of his son Horus (Re) from the “place of the dead” (Hell). This has been covered in much detail in this entire series of articles, but there has been a recent “Paradigm Shift” in the “Arrow of Re” that clearly shows something new in the spiritual realm has and is about to occur. 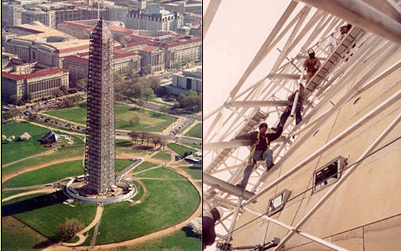 When Ronald Reagan faced the Obelisk as the first U. S. President to do so while taking the Oath of Office, the grounds surrounding it were different from what they are today. 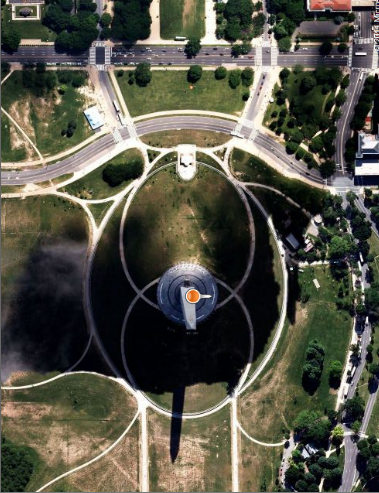 Since that time, several renovation projects have taken place on the Obelisk (Phallus of Osiris); and a major change in the ground surrounding it has also taken place since 1981. The old look clearly depicts the “Arrow of Re“, which as we’ve already seen, is a symbol that foretells the “resurrection/re-incarnation/rebirth” of Osiris in the form of his son (Horus/Lucifer). 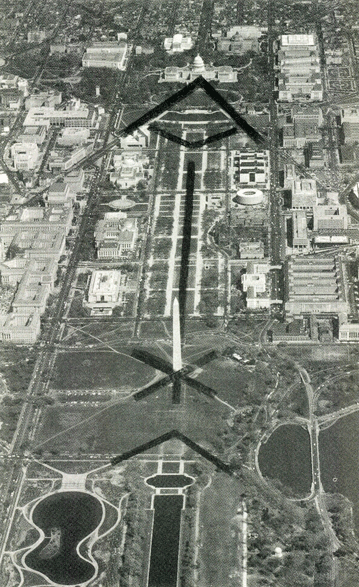 Note that the “X” formed by the paths leading to the Obelisk are still intact at this point in the series of restoration projects that have taken place since 1981. 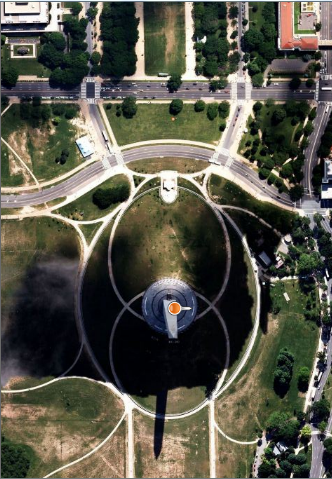 While the ground surrounding the monument had not changed at this point, something “special” was in the “planning stage” as you will soon discover. The ancient Egyptian Book of The Dead speaks about Re “coming forth by day” out of the place of departed spirits (Hell, Bottomless Pit) into the light of day! As we have previously shown, Satan attempts to counterfeit everything God does, and the bringing forth of his “messiah” is no different. Just as the Holy Spirit was the “seed” by which Mary, the mother of Christ conceived as a Virgin, Satan is attempting once again, I believe, to imitate the very same event in bringing forth his son Lucifer/Antichrist! Before Re can “COME FORTH INTO THE DAY”, the “seed” of Osiris/Nimrod/Apollyon that results in the birth of Horus/Re/Lucifer/Adonis/Antichrist must first be implanted in the “womb of Mother Earth”. This womb is the place of the “dead spirits” (Hell) which, according to Scripture, is inside the earth until death and Hell are cast into the Lake of Fire. The Ancient Egyptian Book of The Dead was calling for the “reincarnation/rebirth/resurrection of Re in the form of Horus – the son of Re. So when did the “conception” (spiritual implant of the Osiris (serpent’s seed) take place? It is my personal belief that it took place at the moment Ronald Reagan was elected President of the United States in November 1980. We have already looked at the possible birth of Christ as being on 9/11 of 3 B. C. and Reagan’s year of birth as being 1911, but there is more to this parallel of the counterfeit messiah vs the real Messiah – Jesus Christ. When Jesus was conceived, there was no mention of his conception to the world-at-large. Also, neither Reagan’s conception nor his birth was likewise anything special for the news media of the day. Jesus was confirmed as the Messiah and the Son of God during His Baptism by John the Baptist. At the age of thirty-three (33) He became the Resurrected Messiah and the Savior of the world for those who receive Him. He became the King of a Royal Priesthood and a Holy Nation. From 1980, the year of Reagan’s Election (his confirmation as the leader of the strongest most powerful nation on the face of the earth – a world ruler – a type of King) will be exactly thirty-three (33) years to the year on 1/01/2013! And the year, 2013, is 20 + 13 = 33! This is THE YEAR that I personally believe that Antichrist will step onto the world stage as the greatest actor (impostor) of all time, and then claim to be the world’s savior – God “reborn” in the flesh of a man! This year, 2011, could well be called the “Year of Reagan” since it is celebrating his 100th birthday. However, 1980 was the year that Reagan first gained world power, authority, and leadership by his election to President of the United States of America. Consider the following in Jewish Gematria in light of the year 1980 and Reagan. 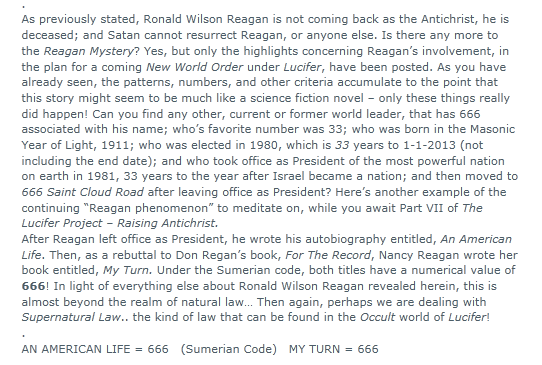 There’s even more mystery surrounding the year and date, 1980, in regard to Ronald Reagan and the numbers 666 and 1212. As shown previously, the name RONALD WILSON REAGAN has six letters in each name which is 666, and his full name adds to 1212 in English Gematria. 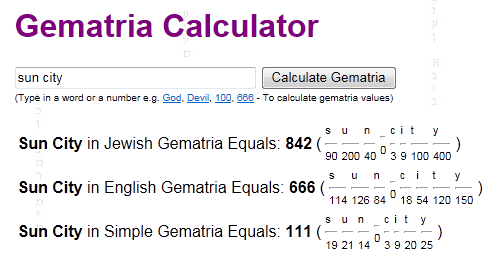 Guess what six six six and twelve twelve add to in the English Gematria Code? Before any reincarnation/rebirth/resurrection can take place, there must first come a “transformation” of that which is to be “raised”. In the case of Jesus Christ, His body was transformed from a mortal body into a supernatural body having no blood – a body that can never die again! We are talking about the fleshly mortal body at this point, not that Jesus was not already God in the flesh before He was crucified. As Satan’s counterfeit, the Antichrist, as shown in the reincarnation/rebirth/resurrection ritual will go through a counterfeit process before “coming forth by day” from the place of “departed spirits”. Reagan was a type of Pharaoh (King) as President, so let’s take a look into the “transformation” phase in this process that started with the Arrow of Re. Kheperkare Senusret I, Khakheperre Senusret II, Aakheperkare Thutmose I, Aakheperenre Thutmose II, Menkheperre Thutmose III, Aakheperrure Amenhotep II, Menkheperrure Thutmose IV, etc. “Popular interpretation in modern academia theorizes the hieroglyphic image of the beetle represents a triliteral phonetic that Egyptologists transliterate as xpr or ḫpr and translate as “to come into being”, “to become” or “to transform”. The derivative term xprw or ḫpr(w) is variously translated as “form”, “transformation”, “happening”, “mode of being” or “what has come into being”, depending on the context. It may have existential, fictional, or ontologic significance. In other words, the Scarab represents the Son-god Re being “transformed” into a Pharaoh (King) that is predestined to raise again to rule – to “come into being“! This is the Luciferian belief system, that their “coming King” (Lucifer) will come as a “god” to rule the final New World Order. Think of the Apotheosis that took place in the Capitol Dome as Re-agan “lied in State” to get a grasp of this picture. Please review The Lost Symbol Decoded for review at https://watchman33.wordpress.com/2010/01/19/the-lost-symbol-decoded/. Now for the summary and the reason this article was entitled – The Paradigm Shift! 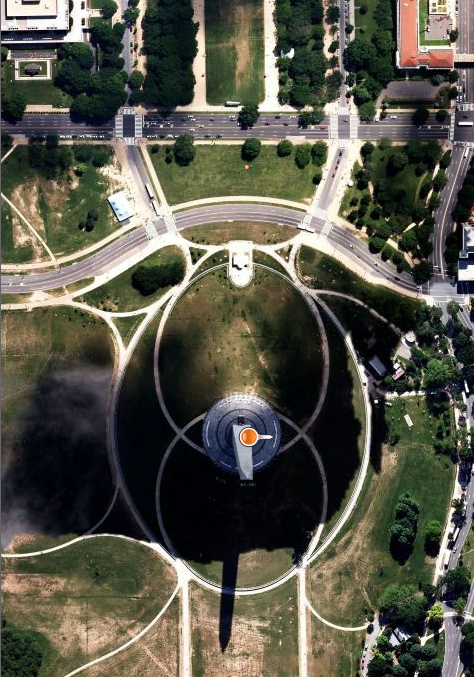 We have experienced a “Paradigm Shift” in the Arrow of Re in the appearance of the Scarab on the Mall. What does this change imply? I personally believe that it simply means that the Apotheosis and the Transformation has already taken place, and the next phase of Satan’s plan as shown in – The Lucifer Project – Raising Antichrist – is very near completion! 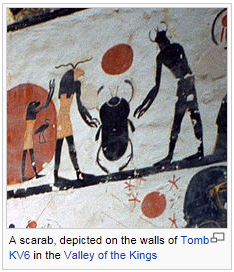 The Scarab has crawled out of the hole in the ground in which it was hidden into the light of day! The final phase of the reincarnation/rebirth/resurrection ritual pictured in the Arrow of Re is that the “reincarnation” and “transformation” stages will result in that which is to come next – Lucifer will “come forth into the day“! 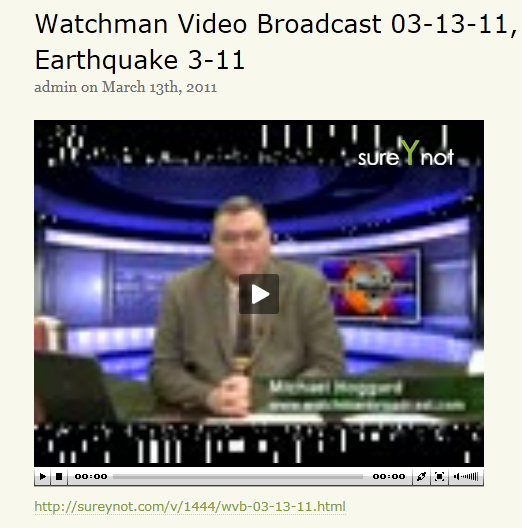 What does the earthquake in Japan on, 3/11/2011, the numbers 70 and 33, and Wal-mart’s logo have to do with any of the things that were just revealed in the above? 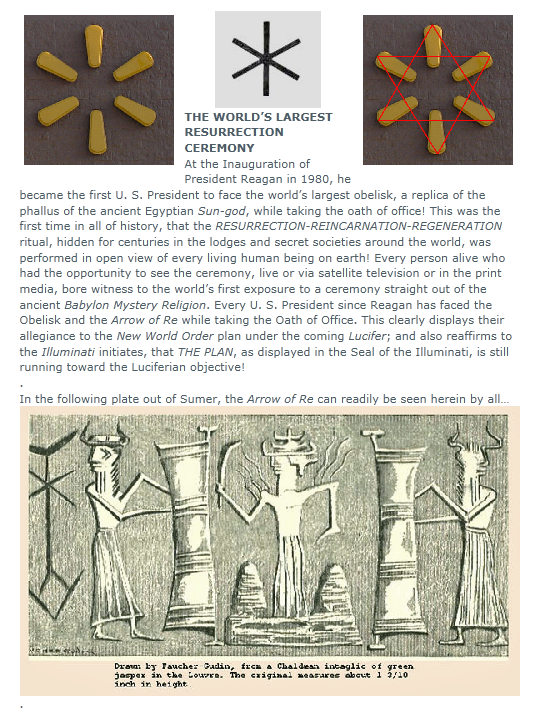 The number 33 is the number associated with “resurrection” and “transformation“, and the resurrection via reincarnation of the Son of Perdition is at hand! The number 70 has to do with dominion and authority. Ronald Reagan was 70 years of age on, 3/11/81 (his 1st year in office), and 3 x 11 = 33. The date can also be written as, 3/11/11, (1111), another sign of a “Gateway” being opened. For more on this and many other things regarding the “signs of the times”, please view the video at the following link. I believe that you will find it to be time well-spent! As you watch the following video, if your stomach can take it, pay close attention to the words being said and the “props” in the video. The “transformation” and “rebirth” is well underway! Since some parts of the video are copyrighted, just click on the “play on YouTube” to watch the video. The lyrics of the video can be read at the following link. Which “god” do you think is in reference here in this so-called “picture of birth”? I was unable to do so, so I searched on your website for “The Lucifer Project – Raising Antichrist Part VI, in regard to the “Arrow of RE”.” and got no where. I would like to se that article and copy from there, with your permission. Would you send me the link? Phyllis, here’s the link @ https://watchman33.wordpress.com/2009/05/08/the-lucifer-project-raising-antichrist-part-vi/. However, one can page through all the articles by going to the bottom of the page of any of the articles and clicking on “Next Page” or “Previous Entries” (either back or forward) to see all of the articles with their respective titles. Hi Watchman33. I never read the lucifer project but I am aware of the story of the obelisk as told by a Jesuit Priest by the name of Alberto Rivera. (Now deceased). While there is no arguing about your theories on former president Reagan’s role in prophecy, one has to wonder what the Vatican’s role will be during the initiation of the NWO. Without wanting to sound like a broken record, I did point out some time ago that the Vatican also has its call letters as 666 in Roman numerals. Add all three and you get 666. I’m sure you’re familar with Tom Horns writing so I will point out this article he wrote in reguards to the Vatican. In persecutione extrema S. R. E. sedebit Petrus Romanus, qui pascet oues in multis tribulationibus: quibus transactis ciuitas septicollis diruetur, et Iudex tremendus iudicabit populum. Finis. In extreme persecution, the seat of the Holy Roman Church will be occupied by Peter the Roman, who will feed the sheep through many tribulations; when they are over, the city of seven hills will be destroyed, and the terrible or fearsome Judge will judge his people. The End. Here is the link to Tom Horn’s article. PS: I also found this yahoo article from last month very interesting. Are they trying to tell us something for May 1, 2011. It tells me time is short. Here is the original Video I posted last year on your website. God Bless. While I’ve primarily avoided most of the issues relating to Pope John Paul II in regard to End-Time Prophecy because of writing about the “Reagan Mystery”, nevetheless, I have included several “key points” about this pope. This is no question in my mind that he will indeed play a part in the coming Antichrist Kingdom, but most likely as the “False Prophet” – not as the coming Antichrist. Reagan and Pope John Paul II were a “global team” (political and spiritual) that facilitated the “The Plan” of the Illuminatia/Luciferians to usher in the New World Order under Lucifer/Antichrist. While my next article may have more to say about this former pope, my primary emphasis will always be upon the “entity” who is to return as Lucifer/Antichrist. You might better understand my take on Reagan and Pope John II if you read all the articles presented here dealing with the issue – The Lucifer Project – Raising Antichrist. The Yahoo link for May 1 seems to be missing. Hers’s another link. and the wisdom you bring , thanks again for all your hard work..
your brother in Christ Jesus. chuck C.
Thank you Chuck! I’ve been “under the weather” (an attack) for the last month or so, and recovery has been slower than I ever expected. I do have another article that I hope to post shortly (after it’s written). While I could post something daily as most bloggers do, I only “wait upon the Lord” to direct my thoughts, words, and effort to post what I believe that He would have me to reveal. The “Japan situation” is critical to the entire world, but update information regarding this and most “DAILY NEWS” from a “Watcher Viewpoint” is available from Steve Qualye, Tom Horn, and Stan Deyo, as well as other web sites to which “links” were listed in a previous article. So unless directed otherwise by the Holy Spirit, I don’t plan on duplicating what is posted at these and other sites on the net regarding “current events”. Yes, I surely agree with Chuck C! You are very missed, Watchman. The Watchman stands high on the wall over the “city”, and watches the horizon. The people dwelling within do not see what he sees. We are to look to the man/woman on the wall to know what/who is coming, how far the distance, and to sound the alarm that the enemy is at the gates. More important….who/what is at the gate,.. friend or foe in “sheeps clothing”. The protected people have a job also…to pray and seek the guidance and help of the only One who can save. The Watchman sounds the warning/alarm. The Lord Jesus alone can save. We trust and respect you, Watchman. I know you will will continue to enlighten us, inform us, sound the trumpet when we need the alert. You and your family/ministry be safe and well. and in the middle of the night, I know I’m preaching to the choir, but sometimes it’s nice to have confirmation from others that it’s not just you but others are also going thru it too. brother you have my E-Mail and I hope you use it ..
your brother in Christ Jesus .. Chuck C.
Praise the Lord. What an amazing God we serve! We must continue to hold up all the faithful watchmen/women. There are several of you that are under massive attack. The people who pray for the watchmen get attacked also. Troublesome times are truly here. This was great news, Watchman! just checking to see if your still kicking, and doing well , you’ve been on our mind and prayers .. thanks ..
Decided to check the “comments” to see if there was any news about why your web site has been “off base” for awhile. Now I understand. You have been in my thoughts and will now be in my prayers. Satan has been working overtime on the “overcomers” that are bringing forth the truth of today. I hope you will soon be up and over all of this and that your entire family will be blessed and well. Watchman, you continue to be in my prayers also. I continue to pray for you, and you have really been on my heart lately even more so. Watchman, guess what I wrote above sounded pretty redundent. I apologize. I, too, have been going through a hard time, a time of grieving, seeking a “light at the end of the tunnel” that is our Lord Jesus, not another train. Sometimes, when I word things, I don’t make much sense these days. However, please know I sincerely pray for you. You come to mind often. I pray for your spiritual, mental, emotional, physical healing. just wanted to say I was happy to to hear the good news , that things are going better. and I had no doubts that others like phyllis, are praying for you and your family. and just as phyliss stated we are going thru major trials but the lord is faithful and see’s us thru even when I can’t see the end result as yet , romans 8:28. and on a side note i’m watching the whole worlds economy on the verge of imploding and the the average person and those who claim to know the Lord Jesus as their savior not making any preparations, they should learn the lessons of joseph, but all i hear from them is that ” the Lord is in control” , and while that is a true statement. that does not negate our responsibility to be good stewards, I believe the time is close at hand that will test our faithfulness and separate the talkers from the walkers , I pray the Lord give us strength when we need it, and keep us faithful thru till the end. your brother in the Lord Jesus Christ.. Thank you so much for the encouragement and prayers! You are so correct on the need for Christians to be “prepared”, yet most are like the “five foolish virgins” spoken of in Matthew Chapter 25, they are not prepared for what is coming upon the earth, them, and their families. My prayer is that their eyes will be opened before it’s too late! Yes, we need to continue in the Faith until the end in order to be saved according to Scripture. Amen, Chuck! Even on partial Soc. Sec., I have been putting some aside for my family where I can. Over time, it is a reserve that has helped already in many ways. A year ago, when some tragic family separation issues occurred, it was Joseph that kept coming to mind. I think the “pre-trib rapture” issue is what keeps good Christians from understanding. There is too much confusion on that issue. I do not want to raise a painful subject here, but I believe that is why so many in the “church” that I have tried to encourage to prepare to take care of their families has rolled their eyes and ignored my warning. Hopefully, the financial crisis we are in will give more folks an understanding of how treacherous the coming year/years will be. Take care, be safe…and you also our Watchman 33! The “Pre-Trib Rapture” teaching has lulled and is continuing to lull many a good Christian to sleep! In all my years of researching the Scriptures, I cannot find that teaching supported. I once had a Baptist pastor, I was rasied in a Missionary Baptist church, that had the entire New Testament memorized, and most of the Old Testament, and a THD behind his name. At breakfast one morning, after having searched the Bible for documentation that the “rapture” was “Pre-Trib” and not being able to find it, I asked this question: “Pastor, can you show me Scripture that proves that the “rapture of the Church” is a Pre-Tribulational event? He said: “No!” I said: “Then why do you teach it and preach it that way?” He said: “That’s the Baptist Doctrine, that’s what I was rasied to believe, that’s what I was taught in Seminary, but most importantly, that’s what I CHOOSE TO BELIEVE!” Now my fellow brothers and sisters in-the-Lord, that is what I would call an “honest answer”! Not all Baptist churches support or teach a Pre-Trib Rapure of the Church, but the majority certainly do. I think of you often and pray the Lord provide for your needs. to put it down on paper so to speak.. thanks again for listening, and we await your next posting . eveyone have a great weekend .. Yes, things are going good again, and I’m working on putting up that next article. In fact, there are two articles that I hope to post within the next few days. It’s really encouraging to have anyone looking forward to my next posting! Wonderful, so glad to year that you are doing well again, Watchman!! Looking forward to what you have to say. Thank you for the greetings, Chuck. I hope you are doing well in all ways also. So, there are two of us Watchman, awaiting your two new articles. I am sure we are on the tip of a very large “ice-berg” looking forward to them. you could be a great author. I will make certain to bookmark your blog and will eventually come back down the road.